Chicken. I love it. Sock it to me fried, roasted, baked or boiled, I don't care, just keep it coming! I'd like to think I look as cool as Busta Rhymes when I'm tearing flesh from bone but somehow, I don't think so. [ADVERT]That said, there is one particular type of chicken that I find exceptionally superlative, and that's the schnitzel. 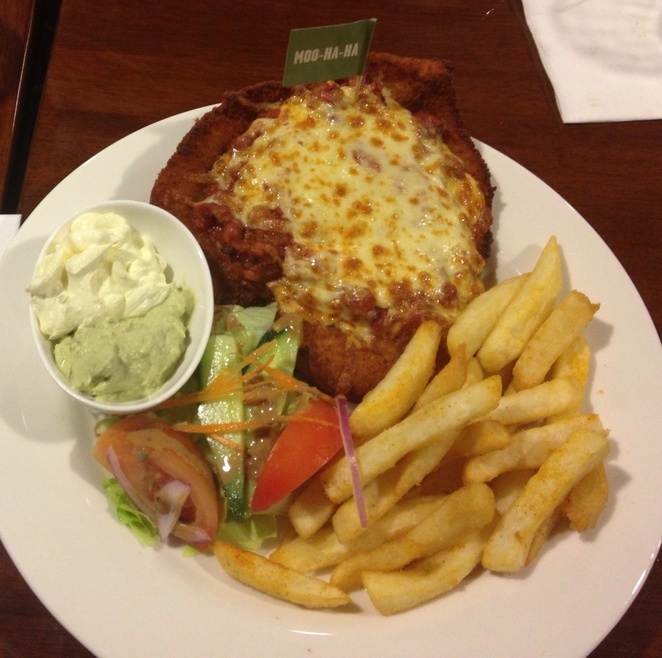 The Wiener schnitzel, a breaded veal creation, is the national dish of Austria; figuring that, since we practically share a name so why not a national dish, we Aussies decided to go ahead and appropriate that right up. Ask for a schnitzel (or schnitty) in Australia and you'll receive a delicious slice of boneless chicken, tenderised, crumbed, and deep fried. Does it get any better than that? The House of Schnitzel business model is as simple as it is genius – take a schnitzel and dump a bunch of stuff of top. Great thing becomes even greater. The Seasational is topped with Moreton Bay bug meat, prawns, scallops, seafood mornay, avocado and mozzarella. 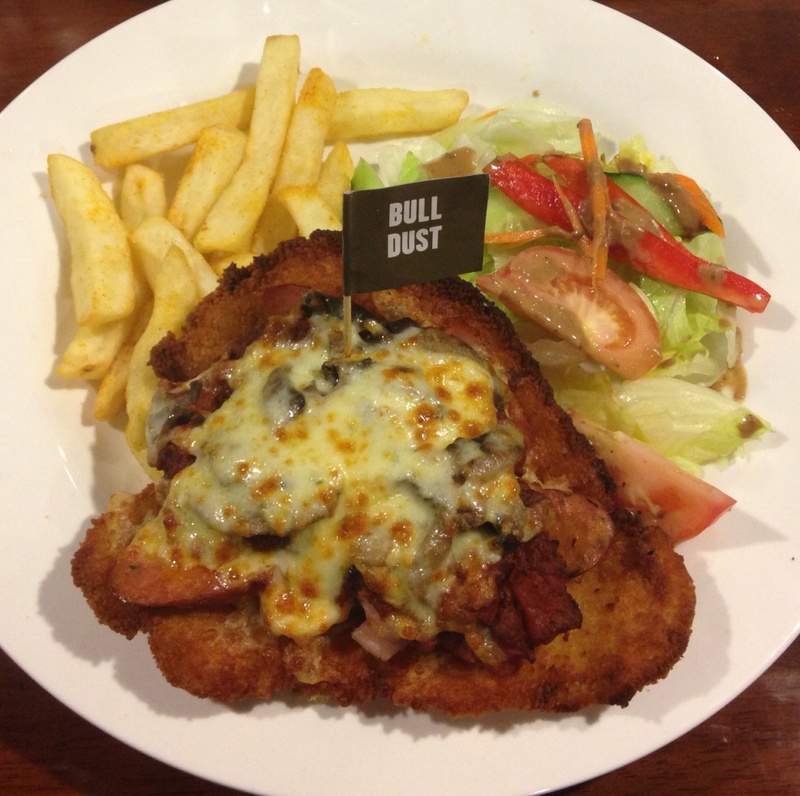 The Bull Dust comes with bacon, chorizo, beef bolognaise and mozzarella. Moo-Ha-Ha is covered with beef chilli con carne, sour cream, guacamole, salsa and mozzarella. 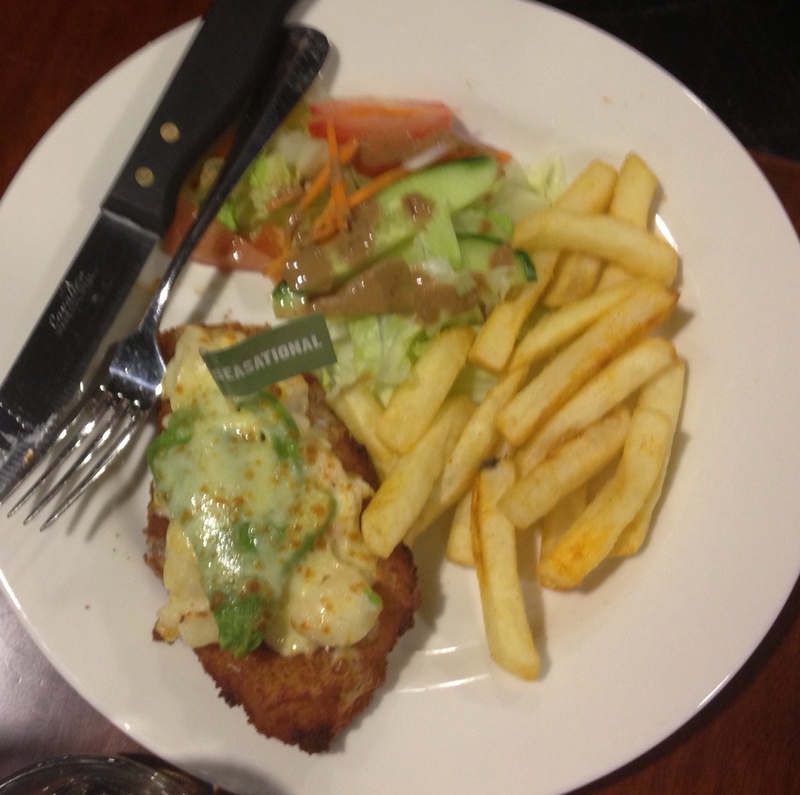 My only complaint is that my schnitzel, the Seasational, was a bit dry, but I think that was because of the size. The medium and fair dinkum sizes were tender and juicy. But there's more to House of Schnitzel than layers of deliciousness. Despite its location within a pub, I do believe that House of Schnitzel may be the most child friendly restaurant in Brisbane. 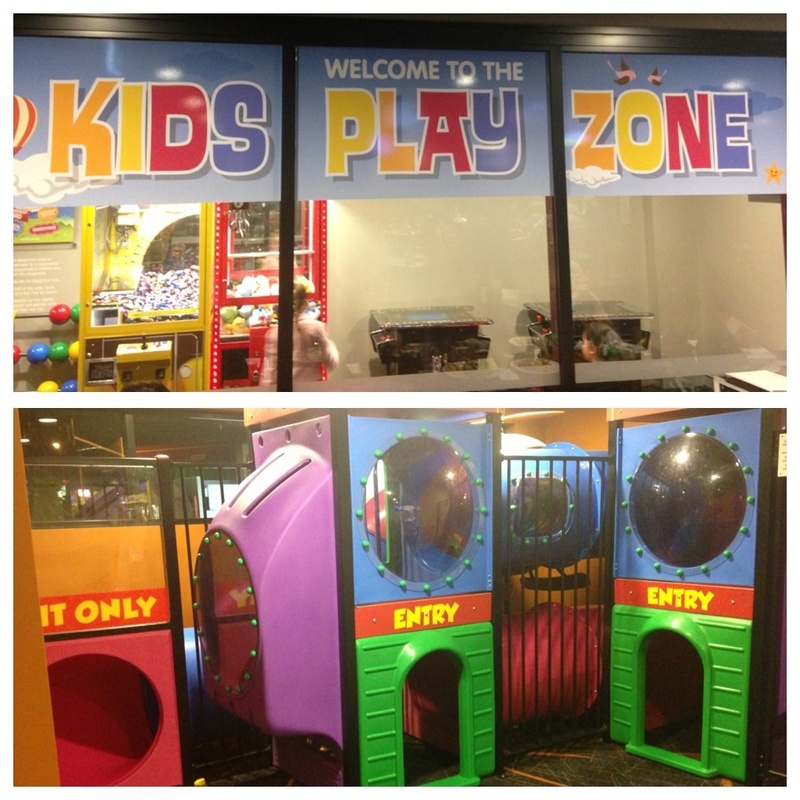 Kids eat free on Monday and Tuesday (or, more specifically, one kids meal is free with every main meal purchased) and the Kid's Room boasts televisions, video games, a chocolate machine, and a plastic behemoth of a playground. Pay a visit to the House of Schnitzel to see what happens when you take a cultural icon and make it even better. I just love the title of this article. I think I might name my own home the 'House of Schnitzel.' An ultra daggy mosaic name plate near the front door. It is good that they offer different sized meals, so people with varying appetites can enjoy the food. These kind of meals often only come available in huge sizes, meaning people with smaller appetites either have to leave half of it or miss out. Had a very disappointing visit to the House of Schnitzel on Monday night. Took over half and hour to even order our meals the line was so slow. We were advised on ordering that the meals would be at least 40 minutes away but breads and kids meals were arriving straight away. On reminding the wait staff 30 minutes later we were advised our bread order was lost and would be another 5 minutes. Our meals arrived 65 minutes after ordering and were pretty average - bit dry and mine was lukewarm. The salad served on another plate was brown around the edges and not at all appetizing. It was a busy night and I am guessing they were low on staff - not sure our party would venture back.